When your gift calls for the best of everything Eli's, this is it! 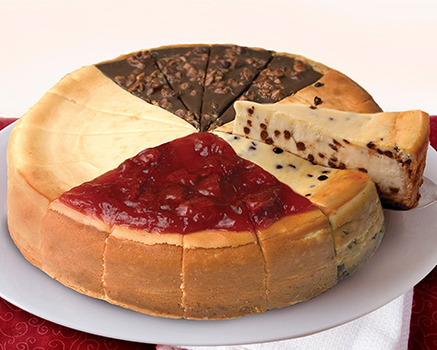 One 7" Original Plain Cheesecake, one 9" Strawberry Cheesecake and six Original Dippers®, the ultimate frozen treat. Cream Cheese (Pasteurized Milk and Cream, Cheese Culture, Salt, Carob Bean Gum, Guar Gum), Dark Chocolate Coating [Sugar, Chocolate Liquor (Processed with Alkali), Coconut Oil, Cocoa Butter, Milkfat, Soy Lecithin (Emulsifier), Vanillin], Sugar, Sour Cream (Cultured Nonfat Milk and Cream, Cornstarch, Whey, Guar Gum, Carrageenan, Carob Bean Gum, Enzymes), Egg, Wheat Flour, Butter (Cream, Salt), Modified Cornstarch, Pure Vanilla, Egg Whites, Salt. Cream Cheese (Pasteurized Milk and Cream, Cheese Culture, Salt, Carob Bean Gum, Guar Gum), Sugar, Wheat Flour, Egg, Sour Cream (Cultured Nonfat Milk and Cream, Cornstarch, Whey, Guar Gum, Carrageenan, Carob Bean Gum, Enzymes), Heavy Cream (Cream, Carrageenan), Butter (Cream, Salt), Powder Sugar (Sugar, Corn Starch), Modified Corn Starch, Vanilla Extract, Egg Whites, Salt, Soy Lecithin. Cream Cheese (Pasteurized Milk and Cream, Cheese Culture, Salt, Carob Bean Gum, Guar Gum), Strawberry Topping (Strawberries, Sugar, Water, Modified Corn Starch, Corn Syrup, Cultured Dextrose, Calcium Chloride, Citric Acid, Natural Flavor, Carrot and Black Currant Juice (Colors), Carrageenan, Xanthan Gum and Cellulose Gum), Sugar, Sour Cream (Cultured Nonfat Milk and Cream, Corn Starch, Whey, Guar Gum, Carrageenan, Carob Bean Gum, Enzymes), Egg, Wheat Flour, Butter (Cream, Salt), Powdered Sugar (Sugar, Corn Starch), Modified Corn Starch, Vanilla Extract, Egg Whites, Salt, Soy Lecithin. ALLERGENS: CONTAINS: Wheat, Milk and Egg Allergens. Manufactured on equipment that processes Peanuts and Tree Nuts. James in the prior review rated 1 star, but his review was raving, although I'm not 100% sure it's about Eli's, but it still should not reflect poorly on the item. His review is a 5 star review, just hit the wrong # of stars. And the two things I weantd to be perfect for my wedding day far exceeded my expectations! I cannot thank you and Diana enough for what you both did for our day. You two are a perfect pair and a complete delight to work with. Your work is creative and spot-on. I especially like how you took the items I weantd photographed and made them just as special in photographs as they are to me in my eyes. Being an older first time bride I didn't fuss over certain things and you both made me feel so comfortable and special. Thank you for capturing my day with my family and friends. May you find all the happiness you deserve in your full-time venture! Best of luck always.